In 1998 when I founded The Reading Divas Book Club, my knowledge of starting and maintaining a book club was limited to that information I found as I scoured the internet. It was a proverbial baptism by fire! Sixteen years later, in August 2014, when I co-founded a new club, I was able to do so with confidence because of the experiences I had over those 16 years and I was eager to build on and share those experiences. The Friday Evening Book Club meets monthly at a local community center. Though it is considered a drop-in club – no written bylaws or dues – it has become a close- knit group of faithful members, most of who, had never before belonged to a book club. It has been a joy to introduce the members to new authors and genres they most likely would not have read on their own and to share, the importance of reviewing what you read and of supporting African American authors. 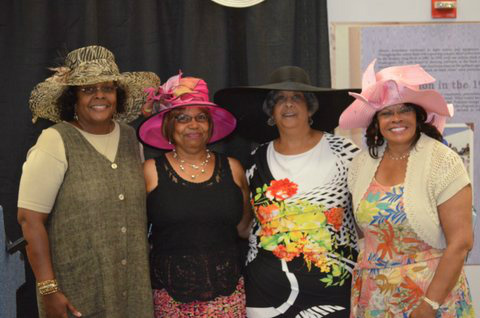 During this year we have hosted several authors, members volunteered at the Prince George’s Book Festival and supported a Summer Tea with ReShonda Tate Billingsley. “Unfortunately my sis-in-law and I will be out of town and won’t be at the next meeting on the 14th, but we just finished reading “Stand Your Ground” and can’t stop talking about it. We sure did like it, found it easy to read, and the story is so relevant and important. We wish we could be present to participate, which we know will be a very lively discussion. However, would you please ask the group if they thought the author must have had a reason behind Meredith having twin boys rather than a single male child? I though the author must have had a reason to end it that way and was curious if anyone else thought so tool. Gertrude and I are at odds about the meaning. Sherry’s review – Rated 10: This is a wonderful romance novel set during the post civil war about a Black female doctor who is met with opposition in a Black community in Michigan. This was a big favorite of he book club. It included fascinating info about actual, lesser-known, African American women heroines and pioneers. Of course, there’s a love story, and everything about it is well worth the read - intrigue, caring, strength, generosity, prejudice, and a happy ending. Also, the author is real good at presenting sensuality but without the use of vulgarity. Be warned -- it’s often naughty, yet maybe nice”. I, of course, wanted to know if she had she posted this on Goodreads and/or Amazon and she told me she had never done so, but would be willing to do that if I showed her how!!!! I can hardly wait.